We analyze microlensing event OGLE-2015-BLG-0448 that was observed close to the globular cluster NGC 6558. The event was moderate magnification and had data taken from both ground-based observatories as well as Spitzer satellite. This makes the event a potential probe for a distribution of planets in globular clusters. The event position on the sky is marked in the above figure. NGC 6558 is well visible. Very close to the event location we see an RR Lyr type variable that hinders precise photometry. The event is located in the low-cadence OGLE field and was scheduled for high-cadence Spitzer observations. The two light curves are presented below. 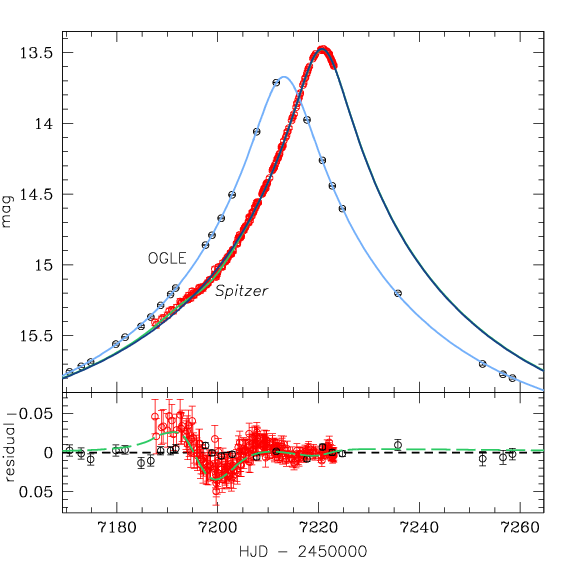 Spitzer data show significant trends in residuals of the point-source/point-lens model. These residuals can be fitted with a planetary model but could be introduced by the data reduction procedures. Due to parallax displacement the planet can be seen in Spitzer data even though it is not seen in densely covered ground-based follow-up photometry (see figure below). Dense follow-up observations were scheduled because of event's special properties and sparse survey coverage. We derive cluster proper motion using long-term OGLE data and compare it with lens proper motion that required Spitzer-Earth parallax measurement. The two proper motions are inconsistent showing that lens is not a cluster member. We used new method to verify if the lens is the member of the cluster. 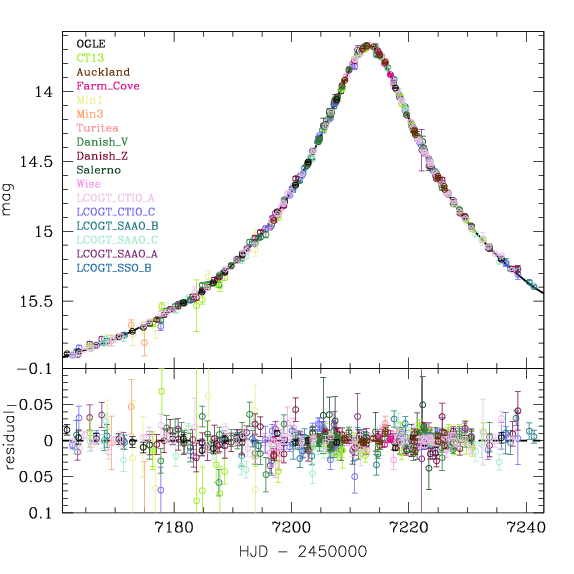 Even though OGLE-2015-BLG-0448 did not probe the distribution of planets in globular cluster, our methodology can be used to verify other candidate cluster lenses.